A host computer or media player may not always be in the same room as its display(s), for example for digital signage where you may want to have several displays controlled by one computer in different rooms, or if you want to add a display to one of your room without necessarily adding another TV box or set-top box. We’ve already seen solution to extend the video signals over a few hundred meters using a HDMI powerline extender or wireless AV transmitted / receiver kit. The former is rather expensive (~$250) and the latter only works with composite. Today, I’ve come across other video extender solutions relying on Cat5/Cat6 “Ethernet” cables, first with an Ethernet to VGA extender kit that sells for $12.99 shipped on Banggood, but there are also Ethernet to HDMI solutions for around $25 to $40 offering a range of up to 120 meters over Ethernet. Both come with one receiver and one transmitter, with the latter connected to the host computer’s HDMI & VGA output, and the former to the display. 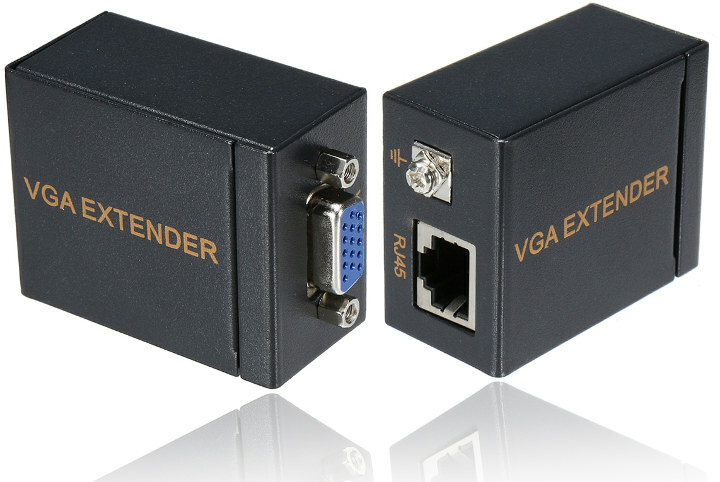 The VGA extender kit shown above can extend the signal up to 60 meters, and no external power supply is needed for the transmitter nor receiver. There’s a major downside however, while it works with Cat5 cables it’s not sending signals over the network, so you can’t simply connect it a switch, and expect it to work, and as I understand it, you’d need to use straight cable between the receiver and transmitter. 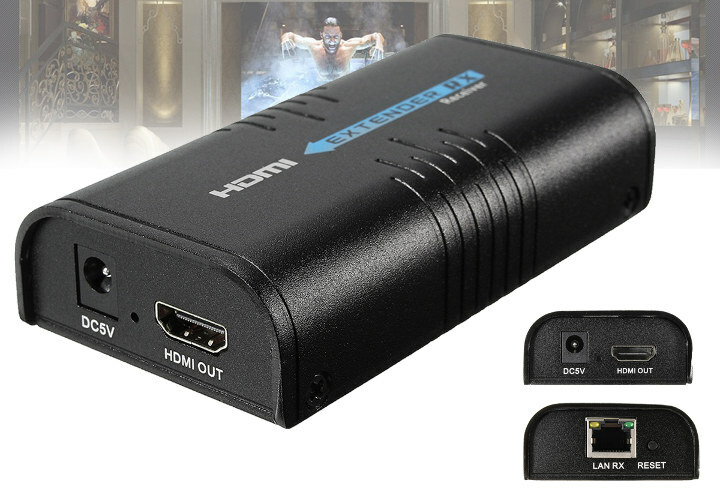 The HDMI to “Ethernet” extenders appears to work the same way support both direct Cat5/Cat6 connection like the VGA model, but can also convert the HDMI signal into IP packets. They come with a 5V power supply for each side, and the ~$40 model can reach up to 120 meters with Cat6 cables. Note that Banggood only sells the receiver, and I could not find the transmitter on their website. The cheaper $25 kit found on Tomtop comes with both Rx and Tx, but the range is limited to 60 meters with Cat6 cables. The maximum resolution supported by the model mentioned above is 1080p60, although there are some 4K HDMI extender over Cat6/Cat7 cables, but they are obviously more expensive with prices ranging from $100 to $300 on Amazon, and the more expensive model supports HDMI 2.0a up to 4K @ 60 Hz over distance up 70 meters. You’ll also notice a $700 model on that page, but it’s based on a fiber optic connection with a much longer 10 kilometers range. 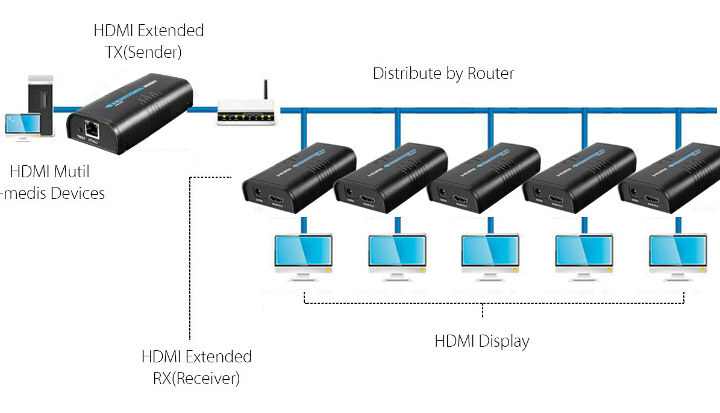 Since the HDMI extenders work over the network, you can connect multiple displays to a single HDMI extender transmitter using a router/switch and several receivers, which can be any device with Ethernet and HDMI output. We’ve got some (iirc Anker) HDMI over Ethernet devices at home and they work really well. The boxes at either end are a bit sensitive to power fluctuations (e.g. turning on a big fan on the same plug multiplier causes the signal to drop for a moment) but otherwise the picture’s great and CAT5/6/7 is a lot thinner so easier to route through trunking to get from PC to receiver to projector. Plus so long as the cable’s good enough you can swap out the boxes and transfer other data, e.g. spdif or USB, future versions of HDMI. The device on Danman blog may be more interesting actually, since it’s actually a network device, while the extenders covered in the post above require their own “network” of cables. We used many of those in planes connecting bulkhead monitors to blueray players. Its an easy retrofit solution. But those areusually not ethernet devices, but only use ethernet type cabling and connectors. I also doubt your statement about connecting several units via switches. As far as we found out (trade secrets you know ) they just take the bits from hdmi and throw them onto a cat6. Thats why those boxes could cope with hdcp, without any kind of certification 😉 the better ones could also fake an edid. Quite handy in case your screen is not always powered on. Low-res VGA maybe. But HDMI is 4 Gbit/s – 38 Gbit/s. No way to transport that over Ethernet without video compression, so it must decode HDCP (1.4) first. You’re right. Reading more about the model from Benjojo on eBay, it looks it supports both modes: direct data transfer over Cat5/Cat6 or transfer over IP networks.